Thrill your senses with this naturally caffeine-free twist on traditional chai. We blend rich South African rooibos with the finest masala spices for a cup that’s warming, robust and subtly sweet. It’s a luscious treat that pairs wonderfully with milk and sweetener. 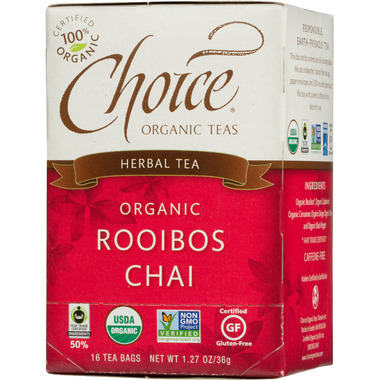 Ingredients: Organic Rooibos*, Organic Cardamom, Organic Cinnamon, Organic Ginger, Organic Clove, and Organic Black Pepper. This tea is a perfect blend when you are looking for a caffeine free chai tea option. I find other brands are too heavy on cinnamon. I take it with a little milk, but you don't have to and it is still very good. Love this tea with a touch of honey! Very happy I found this one! I love Rooibos chai and I love cardamom, so I decided to try this one, hoping the cardamom would be the strength I like and I could use these tea bags for travelling. The bags are wrapped in just paper, so when you open the box, the smell is amazing. But because the paper wrappers are not airtight, you have to keep these stored in a airtight container and use them up more quickly than teas with airtight individual wrappers. The taste is pleasant, but mostly a rooibos taste with a faint spice background taste. I add more spices to the pot when I use this, but you may find you like the more subtle spice taste. It would be a good intro to people who have never tried a "chai" tea before.